The Pomegranate and Beetroot mixture reminds me of the stories in the Pinkalicious Series of children’s book that my daughter used to read few years ago. Those are interesting stories on a child’s love for pink. 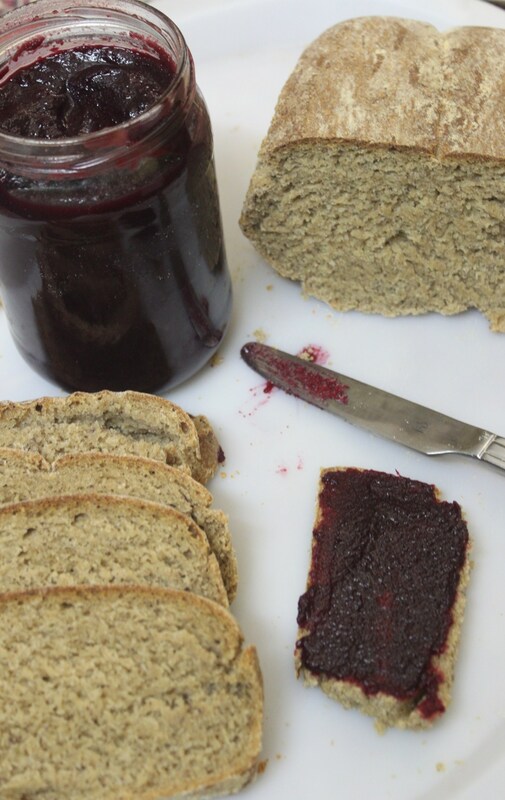 This fruit-vegetable combination exhibits the same color and I hope the jam brings the same brightness to your morning breakfast bread too. There can be numerous passions and obsessions in everyone’s life. It’s a thin line that differentiates both. And when passion turns into obsession, it sometimes becomes a burden. But let’s think otherwise… obsession clubbed with passion can certainly be a joy forever. Why not? Especially, when that obsession is concerned with the well-being of your loved ones, and aids in better life-style through effective foods – there’s no point of having negativity about the word ‘Obsession’. Among my various passions that have turned into obsessions, is the latest one on breads and jams. Jams and Preserves with the best of simple ingredients, along with the goodness of fresh fruits are heated up in my kitchen and stored in beautiful bottles. This time, it is pomegranate and beetroot. The bright color that both these ingredients impart is no match to any artificial pink. The antioxidants preserved by nature in these both are well-known. 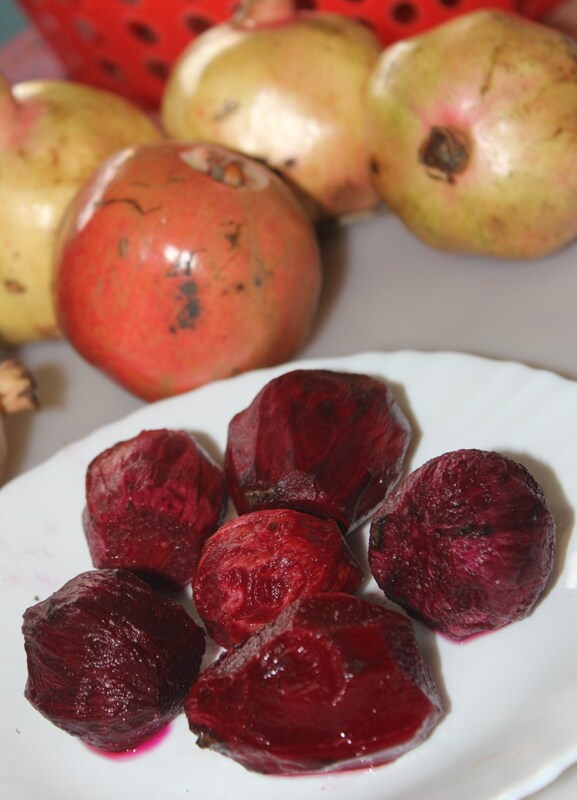 While pomegranates have been included as fresh juices, combined with sprouts for breakfast and seeds mixed with yoghurt rice for the sweet-sour flavor; beetroot has been included as a dry vegetable curry (poriyal), beetroot halwa (sweet pudding) and beetroot cakes (healthy version of red velvet). I have been passionately incorporating a combination of beetroot and pomegranate in my salads along with cucumber and tomatoes. But when passion turned into obsession, I chose to preserve the iron-rich combo pack. When I had a few hand-picked pomegranates fresh from the garden, the idea of making a jam came up. But with the liquid juice from the fruit might need loads of sugar and hours of time to thicken. 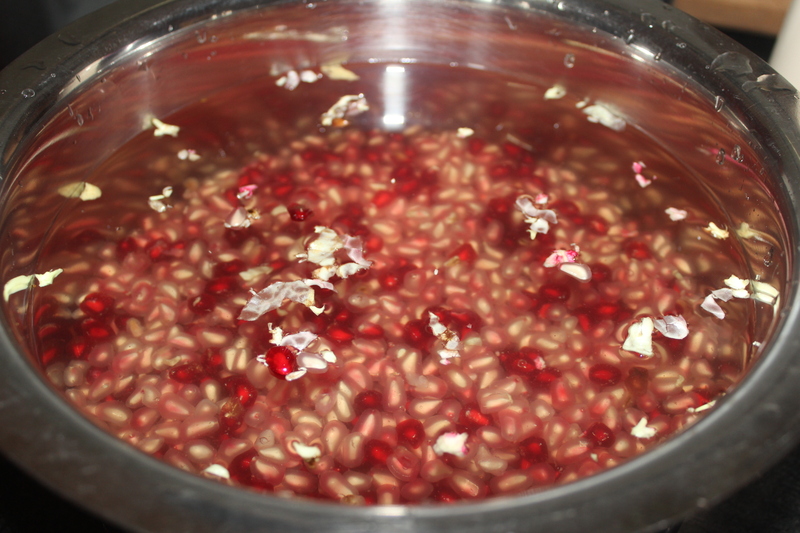 Additionally, the pomegranate variety was white, not the blood red seeds, that would add color to the jam by itself. So, why not combine another similar colored healthy ingredient, that would economize the usage of extra sugar and also save exhaustive time, in bringing a juice to jam consistency. Beetroot came to my rescue. I also added a couple of red seeded pomegranate for my satisfaction of added color. Actually, with addition of beetroot, this was really not needed. The usage the beetroot puree, has most importantly helped not wasting the nutrient value of the iron-rich fruit in extended cooking, plus contributing to the iron content of the end product-jam. 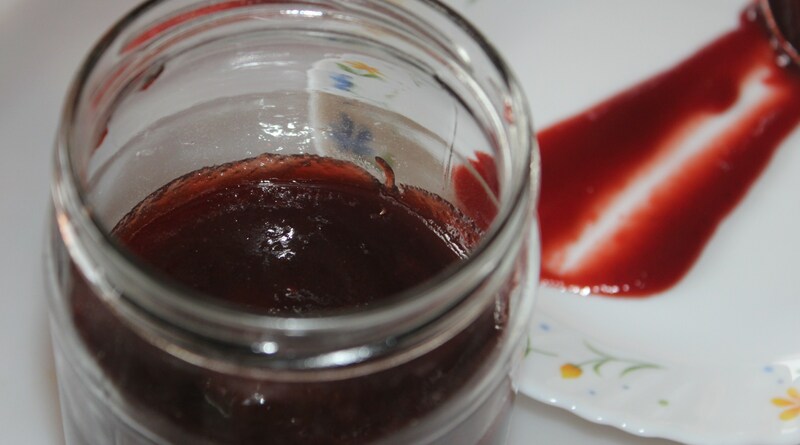 Hence, the idea of adding beetroot puree to pomegranate juice in Jam making, has added volume and color (hope this doesn’t sound like an artificial hair color advertisement) to the wonderful preserve. 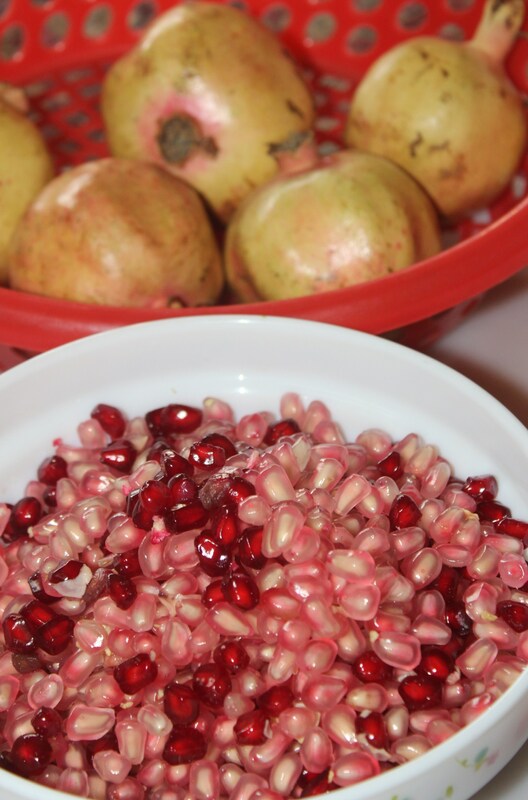 Remove seeds of pomegranates and place in a wide bowl. Wash well and fill in more water to immerse the seeds. This helps the white fibrous layer to get separated on the water surface and seeds stay beneath. 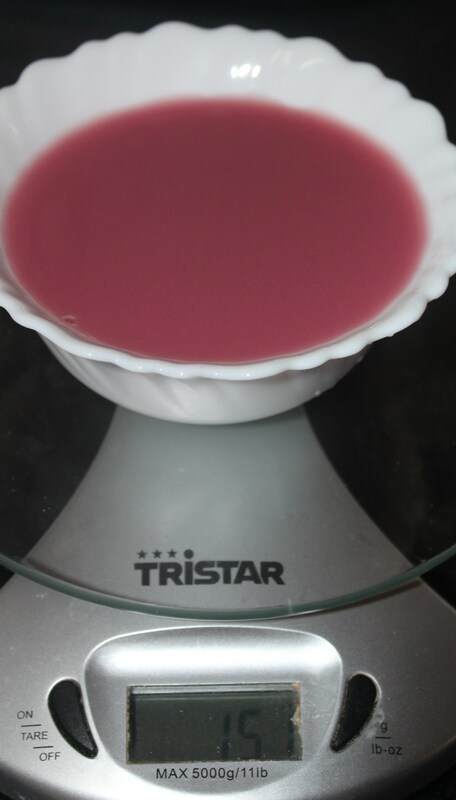 Strain water and extract juice; strain well for a clear liquid. Cut random pieces and let it cook in a pressure cooker. Do not add water to the beets, instead pour water in the bottom of the cooker and place the bowl with beetroot without water and cook; close the bowl with lid. We are not steaming here. So, do not forget the whistle in the cooker. 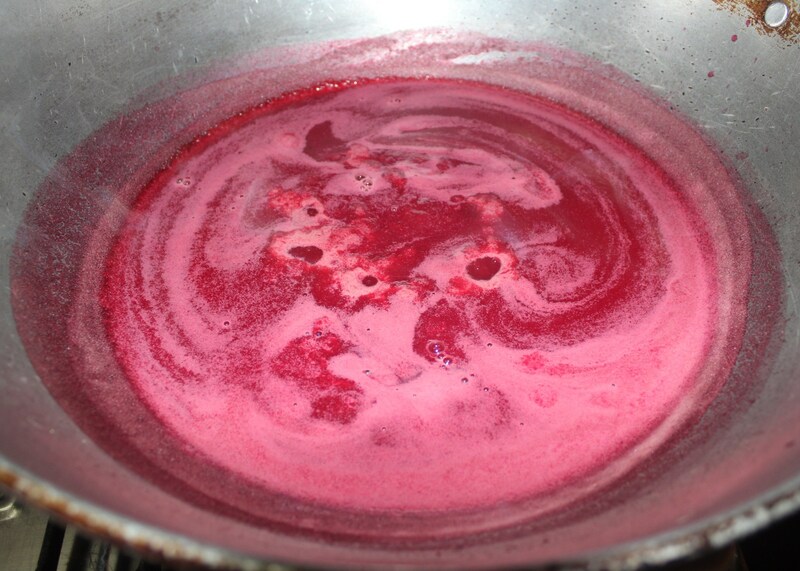 Or cook as you please – the notion is that, we don’t need any added water from cooked beets to make puree. Cook till done. I gave one whistle in full flame, reduced and left it for two more whistles in sim flame, and opened the cooker when all pressure was released by itself. 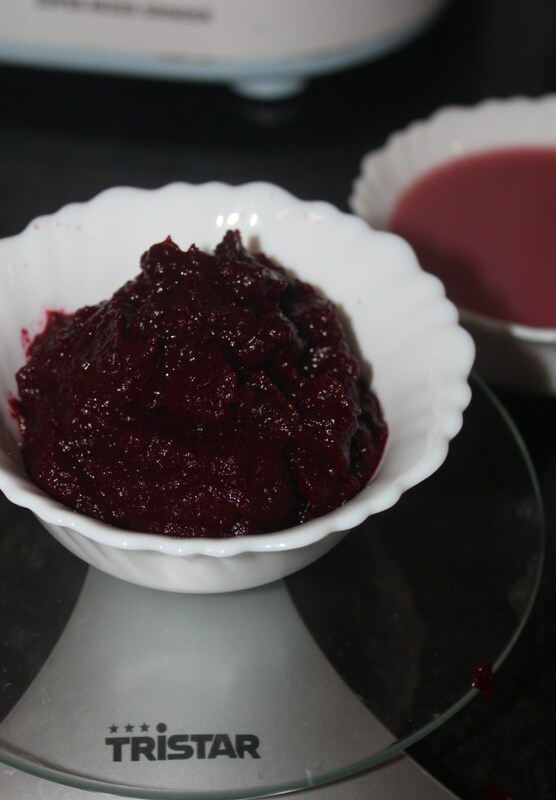 Take out cooked beetroot pieces and make a puree in a blender. 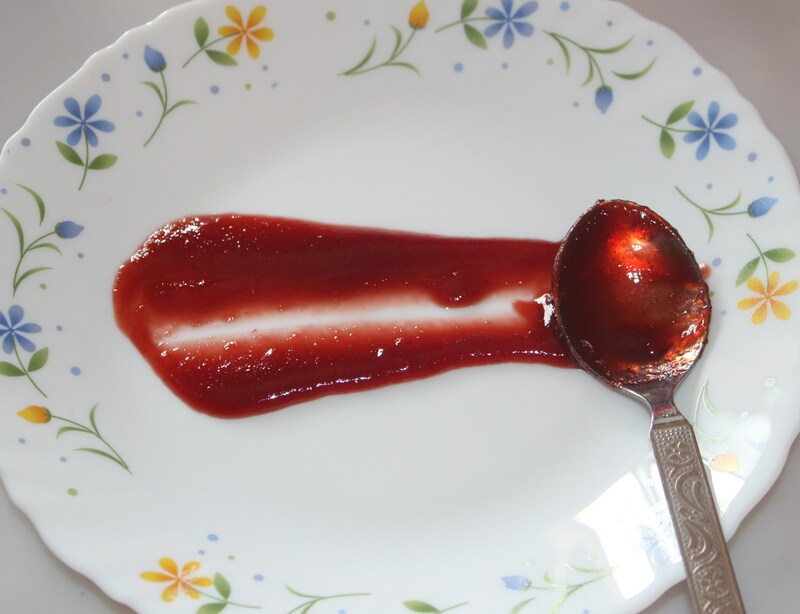 Place a plate in the freezer and a few spoons; we need to check for consistency later by swiping the jam in the chilled plate. 2. Simmer and let cook for ten minutes. You can find a foamy layer settle on top of the boiling liquid. Gently remove foam and let it simmer. 3. After removal of foam, add sugar and lemon juice and cook over medium heat. 4. 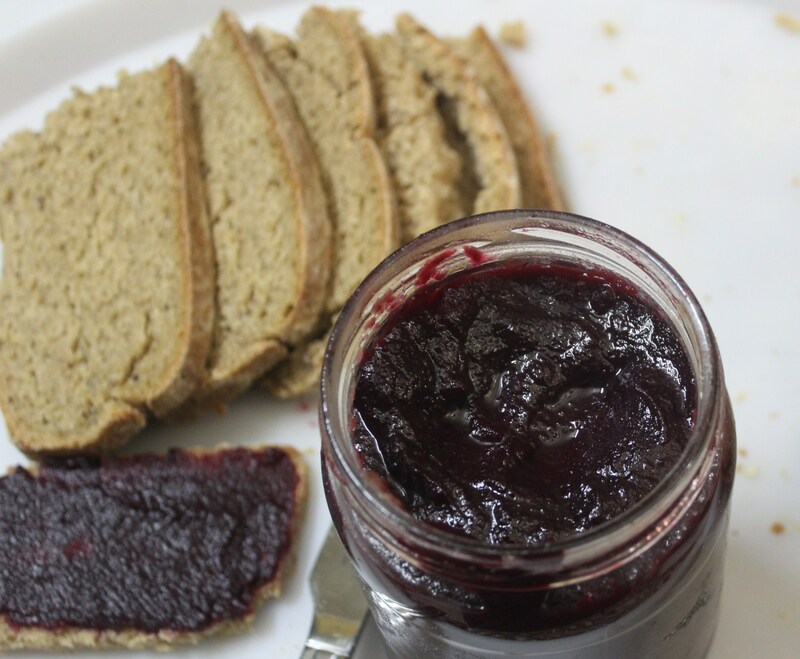 Once the mixture becomes thick, check for consistency : Take the plate from the freezer- place a spoonful of jam on the plate and swipe splitting into two halves. If it sets well and isn’t flowing on the plate, jam is done. Else, cook for some more time. 5. When the jam has reached the required consistency, switched off flame. 6. Pour hot jam into sterilized hot bottles directly from stove and close lid tightly. 7. Do not pour hot jam in cold bottles, otherwise the bottles would crack. 8. Leave the jam to cool by itself. Do not engage in cooling by other means. That would affect the setting of the Jam. 9. 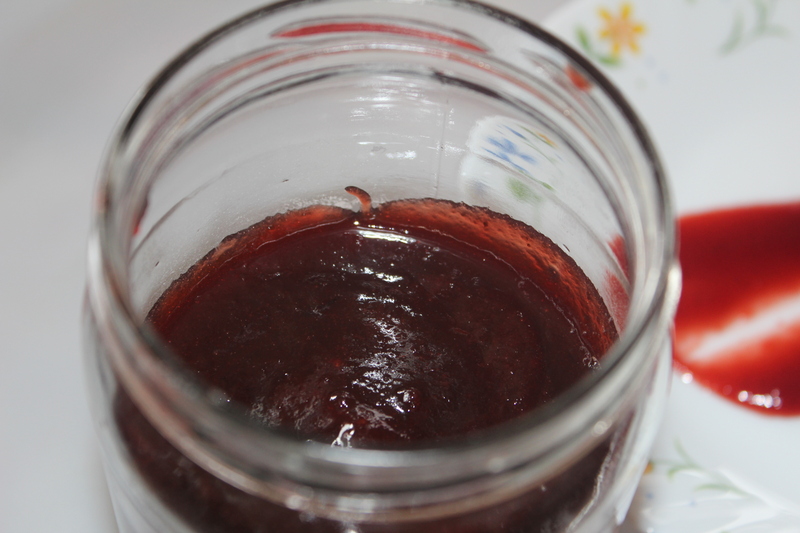 If you find the jam is less in sugar after done, place jam in pan, add more sugar to taste and boil again. If it is too thick add very little water to loosen jam and boil it back to jam consistency with added sugar. 10. Enjoy with home-made bread or bun. Also use in-between biscuits. Previous Post My good bread – a success story!